Konstantinos Tsoumas loves being a charter captain. He says, “The combination of action, applying physics, and physical effort, being with people on vacation mood and the sea as background, is a dream job.” His enthusiasm for the sea radiates to charter guests, who are immediately enchanted by the spirit of sailing. Konstantinos, called Kostas, was born in Thessaloniki, Greece. He grew up with a younger sister in Volos, where he still lives. The yachting tradition was second nature in his family. His father and most of his relatives owned boats and many made their living on the sea. Kostas enrolled at the Greek University to study mathematics, but eventually changed his degree to physiotherapy. He received his diploma in 2006, but his heart had already been captured by the ocean. He began sailing in 2005 and was immediately seduced by the sport. Within two years he was making money from sailing charters and long-distance deliveries. It wasn’t long before he abandoned his profession as a physiotherapist and took to the sea full time. In 2009, he began racing and acquired his first cruising 27-footer. In 2015, he upgraded to a 33ft racer-cruiser. During the past 12 years, his competitive racing has been rewarded with many wins and trophies in local and national events. Charter guests aboard DELICIA will find a Kostas an experienced, dedicated and patient instructor, should they want to learn or improve water sports skills. He says that he’s always keen on teaching. He has worked as a jet ski instructor, taught many to windsurf, and recently applied for certification as a sailing instructor at a special school run by the Greek Sailing Federation. Of course, for those who want to simply relax, a charter in Greece is a magical place to unwind. Kostas' favorite playground is the Cyclades islands in the Aegean Sea. “Many unspoiled islands, short distances, little traffic, always windy, crystal clear water, excellent food, friendly people.” Wherever guests choose to sail in Greece, Kostas charts an unforgettable course. *DELICIA will charter in the Caribbean for the 2019 winter season. 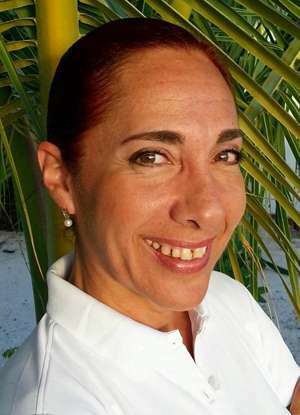 Patricia has over 15 years of sailing throughout the Caribbean. She is an accomplished cook in Italian and Traditional dishes, and pasta making. She is fluent in English, Spanish, French & Portuguese.